Dragon Age's downloadable content has a made a seven-figure sum in its first week of release. EA's decision to have downloadable content available on the same day that Dragon Age was released was a controversial one, so much so that BioWare's Georg Zoeller felt the need to defend it, but it doesn't seem like controversy has stopped people handing over their cash. 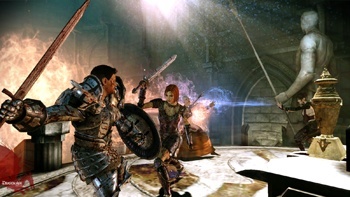 "Dragon Age just launched about a week ago, it's doing very well," said EA CFO Eric Brown "The game was designed at the outset to have [paid DLC] at launch, as well as through the next 12-plus months of its lifespan. We're well past one million in PDLC, so the attach rate appears pretty good." It seems likely that most of that money has gone towards buying The Warden's Keep, which was the piece of DLC not included in most copies of the game. Looks like Day One DLC (DODLC? Nah, too much) is here to stay.